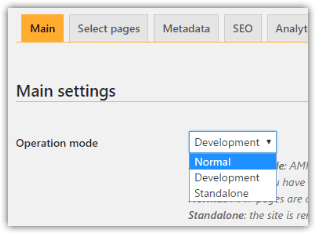 If you did not change the operation mode from its default value ofDevelopment, now is the time to switch back to Normal mode. 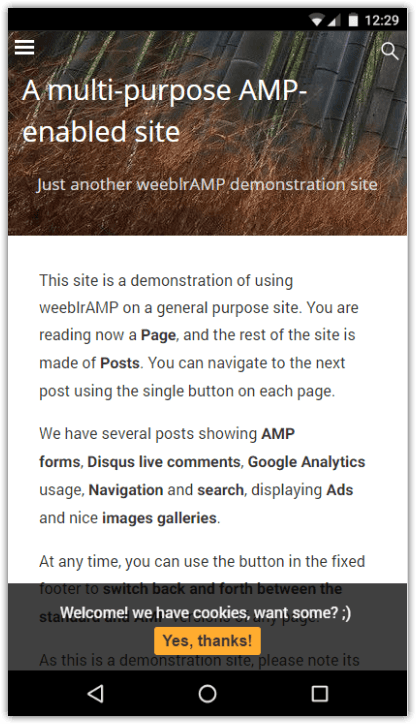 The development mode has let you setup AMP and validate your pages. Switching to Normal mode will make your AMP pages "public", visible to Google and others. By the way, this is a live example, our demonstration site. Feel free to navigate it all, if you have not already. It lives at demo.weeblrpress.com. This example is fairly simple in design, but you can use your own CSS, images, and some AMP-specific tags that we will cover in the Going further section of this documentation.